OMEGA Replaceable Spindles are designed to be used with OMEGA Roller Ratchets® for both installation and removal purposes. To remove the spindle, hold the Roller Ratchet® in hand while pressing firmly on the back of the spindle and rotate spindle and then gently twist and pull. Firm pressure will be required. OMEGA 1/4'' replacement spindle for standard RR-40 roller ratchets. OMEGA Integral #1 phillips replacement spindle for standard RR-40 roller ratchets. OMEGA Integral #2 phillips replacement spindle for standard RR-40 roller ratchets. OMEGA Integral #3 phillips replacement spindle for standard RR-40 roller ratchets. OMEGA Integral #0 slotted replacement spindle for standard RR-40 roller ratchets. OMEGA Integral #1 slotted replacement spindle for standard RR-40 roller ratchets. 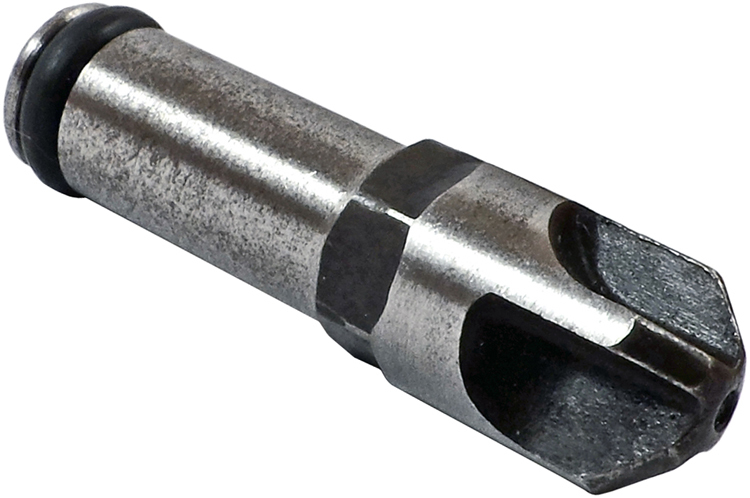 OMEGA Integral #2 slotted replacement spindle for standard RR-40 roller ratchets. OMEGA Integral #4 torq-set replacement spindle for standard RR-40 roller ratchets. OMEGA Integral #6 torq-set replacement spindle for standard RR-40 roller ratchets. OMEGA Integral #8 torq-set replacement spindle for standard RR-40 roller ratchets. OMEGA Integral #10 torq-set replacement spindle for standard RR-40 roller ratchets. OMEGA Integral 1/4'' hex drive replacement spindle for standard RR-40 roller ratchets. OMEGA Integral 1/8'' hex drive replacement spindle for standard RR-40 roller ratchets. OMEGA Integral 3/16'' hex drive replacement spindle for standard RR-40 roller ratchets. OMEGA Integral 3/32'' hex drive replacement spindle for standard RR-40 roller ratchets. OMEGA Integral 5/16'' hex drive replacement spindle for standard RR-40 roller ratchets. OMEGA Integral 5/32'' hex drive replacement spindle for standard RR-40 roller ratchets. OMEGA Integral 7/32'' hex drive replacement spindle for standard RR-40 roller ratchets. The OMEGA RRQC-TS1/4 1/4'' Roller Ratchet Replaceable Spindle is one of thousands of quality tooling products available from MRO Tools. Please browse Replaceable Spindles for tools similar to the OMEGA RRQC-TS1/4 1/4'' Roller Ratchet Replaceable Spindle. OMEGA RRQC-TS1/4 1/4'' Roller Ratchet Replaceable Spindle description summary: OMEGA Integral 1/4'' torq-set replacement spindle for standard RR-40 roller ratchets. Quantity discounts may be available for the OMEGA RRQC-TS1/4 1/4'' Roller Ratchet Replaceable Spindle. Please contact MRO Tools for details.